"Intrigue and an Inn-dependent woman!" After all she had built for herself and the villagers in Buckleigh-in-the-Moor, Meredith Maddox was not going to take it any longer! With a quick tongue lashing and a chilling stare, she soon quieted the louts whose brawling threatened the clean tablecloths and glasses in her tavern, the Three Hounds Inn. Rhys St. Maur, the new Baron Ashworth, could only stare in wonder at this bewitchingly beautiful, tiny, and dark-haired barmaid. Then, when she introduced herself, he couldn't believe she was Merry Lane, the young daughter of his old stablemaster, George Lane, whose leg was maimed forever as a result of the events of that awful night fourteen years earlier. A night so searing on his soul and body that he vowed never to return to this hell-on-earth again! Having shadowed and loved Rhys from afar as a child, Meredith instantly responded to seeing him again. This time though, she vowed not to let her heart rule her again. Along with a few friends in the smuggling business, she had done all she could to keep the little village going-- from letting Darryl have his imaginative tours of the ruins, to her thoughtful improvements to welcome her guests at her inn that brought the much needed revenue to the village. No, she was not for him staying! She was bound and determined to make sure he didn't stay around even though he kept promising and insisting that fate was going to make her his wife. His promises didn't hold water with her. The villagers had been burned by the Maurs, much as their country residence, Nethermoor Hall, which lay in blackened ruins. Rhys' guilt may have led him back, but the village would made to make him leave -- alive or dead! Despite his scars from the many military battles he had been in, the still handsome and rugged Rhys now fought the hardest battle of all - to get the villagers to accept him again and to make Merry marry him! Would fate or hard work win out for him? Despite this seemingly straightforward romance, Tessa Dare has expertly crafted an intriguing and suspenseful novel with unexpected plot twists. 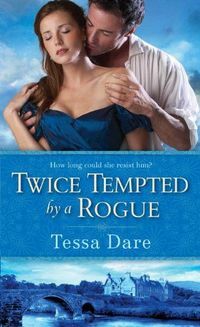 TWICE TEMPTED is the second book in Dare's Stud Club trilogy, yet it works very well as a stand alone novel. This is a very entertaining read that is sure to result in many more fans for this creative and talented historical romance writer! If you are not fully convinced, then check out the absolutely brilliant and ingenious video clip on the Stud Club trilogy at www.tessadare.com! Enjoy! The daring members of the Stud Club are reckless gamblers and no strangers to risk�until love raises the stakes in Twice Tempted by a Rogue. Luck is a double-edged sword for brooding war hero Rhys St. Maur. His death wish went unanswered on the battlefield, while fate allowed the murder of his good friend in the elite gentlemen�s society known as the Stud Club. Out of options, Rhys returns to his ancestral home on the moors of Devonshire, expecting anything but a chance at redemption in the arms of a beautiful innkeeper who dares him to take on the demons of his past�and the sweet temptation of a woman�s love. Meredith Maddox believes in hard work, not fate, and romance isn�t part of her plan. But when Rhys returns, battle-scarred, world-weary, and more dangerously attractive than ever, the lovely widow is torn between determination and desire. As a deep mystery and dangerous smugglers threaten much more than their passionate reckoning, Meredith discovers that she must trust everything to a wager her heart placed long ago.